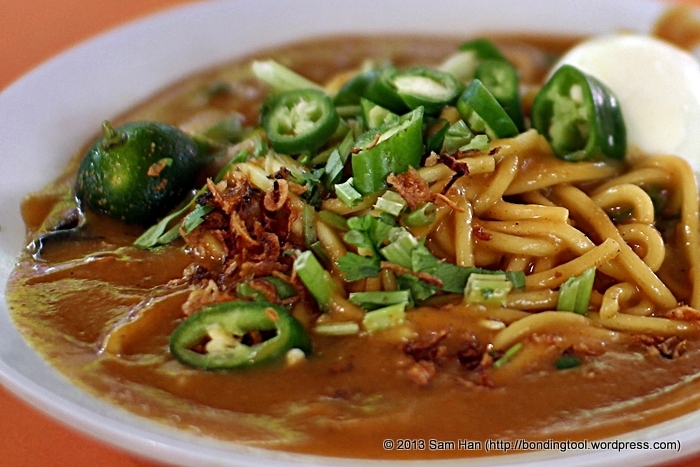 Four to six decades ago, mee rebus was peddled by Malay hawkers who carried two baskets over a pole. One basket contained a stove and a pot of boiling water, and the other the ingredients for the spicy noodle dish. As Singapore develops and street vendors were relocated to food centres, street food became a scene from the past. Today, we can even enjoy this dish at five star hotel coffeehouses with the luxurious addition of prawns and prawns fritters as garnishing. This dish is almost always eaten with satay (skewered pieces of grilled meats) as they complement each other well. In the olden days, where mobile hawking were operated by families, you would find the wife blanching the noodles and the husbands grilling the satays… Those were the days. 1 tablespoon Belachan (shrimp paste block form). 12 slices Galangal (lengkuas or blue ginger). 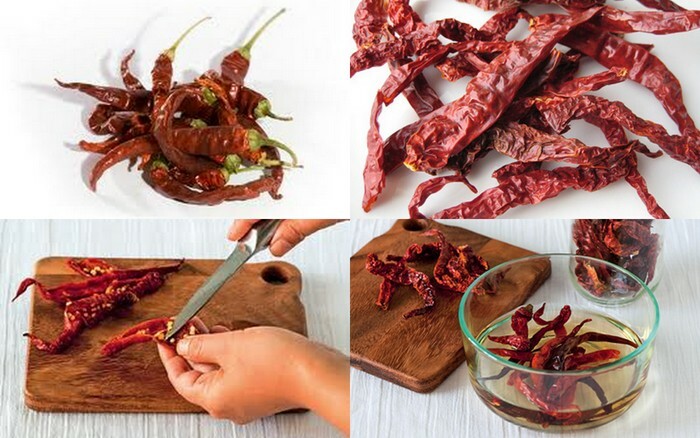 10 Dried Chillies (soaked in warm water till soft about half an hour or more, cut away the stem and remove seeds if do not like spicy). Put all the above rempah ingredients in an electric blender and blend into a fine paste. 4 tablespoons Meat Curry Powder (mixed with 8 tablespoons water to form a paste). 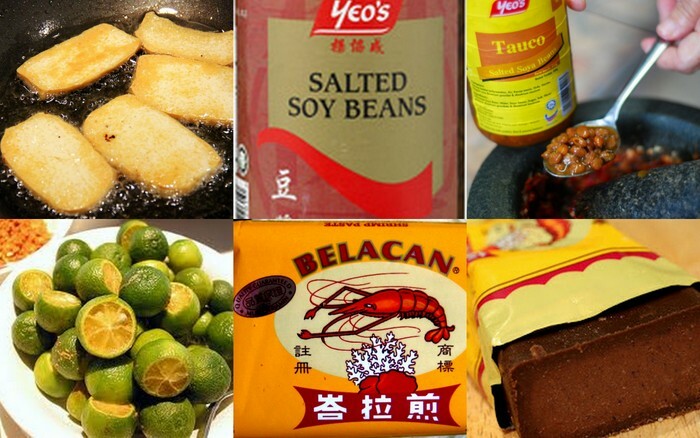 6 tablespoons Salted Soy Beans (Taucheo, mashed). 4 tablespoons Dried Prawns, (rinsed well, soaked till soft and pounded). 150g Peanuts (toasted, remove skin and pound till fine but not smooth or pasty). 300g Potatoes (or yellow flesh sweet potatoes – boiled till soft and mashed). 1 tablespoon Salt (add lesser first and adjust to your taste). 1-2 tablespoons Plain Flour, optional (hawkers do). 1-2 tablespoons Cornstarch, optional (hawkers do). 100ml Oil (may add up to 150ml depending on how much the rempah absorbs the oil). 5 Taukwa, fried and sliced into thick matchsticks. 10 Limes (small calamansi, cut into halves). 5 -10 Hard-boiled Eggs (serve halves or whole). 5 stalks Spring Onions, chopped. 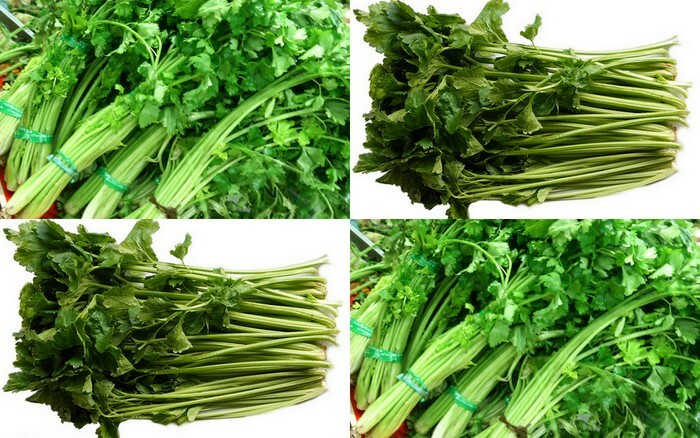 8 stalks, Chinese Celery, chopped (wan sui). Dark Soy Sauce (a few drops to be drizzled, if desired). Prawns, boiled, shelled and slice into halves lengthwise (optional). The garnishing amount is really up to you. 1. Boil the beef or chicken in 2 litres of water and simmer for half an hour and you’re left with 1.5 litres of stock. Slice the meat or shred the chicken. 2. Strain and use stock to mix with the mashed potatoes. If using plain flour and cornstarch, add them to the mash potato now. 3. Heat oil in wok till hot and add in the rempah. Fry for a few minutes till fragrant. Add in the curry paste and dried shrimp and fry till oil oozes out. Be careful not to let the rempah burn, keep stirring on medium low heat. Add in the taucheo (mashed/pounded fermented beans) and fry till fragrant, adding a little stock or water if necessary to prevent burning. 4. Add in the mashed potatoes (already mixed with stock – step 2) and stir well. Add in peanuts and seasonings. Bring to a boil and lower flame. If using beef, add in now and let the gravy simmer for 15 minutes or longer. 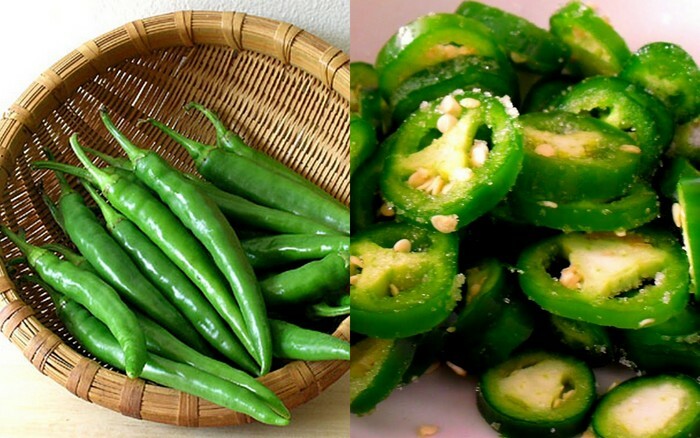 Adjust seasoning to your desired taste. Keep the gravy warm on very low heat while you prepare the noodles. 1. Bring a large pot of plain water the a fast boil. Blanch the noodles and beansprouts very quickly and portion them into serving sizes. 2. Assign about 120g noodles and 60g beansprouts per person, into individual dish or bowls. 3. Ladle enough gravy into each bowl. 4. Top the noodles with the sliced meat or shredded chicken and sprinkle the rest of the garnishing. Serve with half a lime and egg. This is a great party food. All the garnishing and gravy can be prepared in advance. You can set up a “stall” at your garden. Put garnishing and shredded chicken (if using beef, leave them in gravy) in a platter lined with banana leaf. Portion the noodles and then beansprouts into individual plates or bowls. 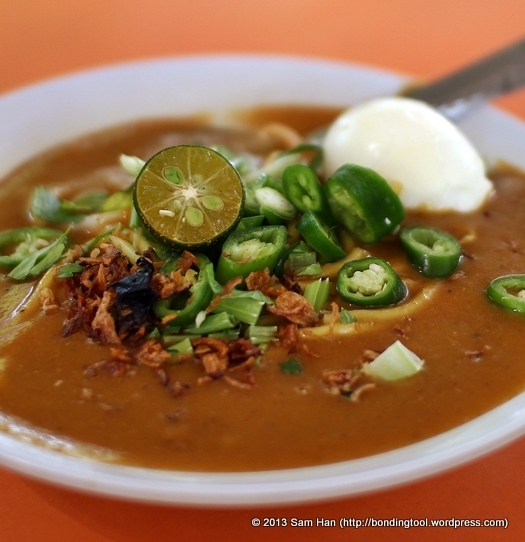 When ready to eat, bring a pot of water to the boil on a portable stove or bbq to blanch the apportioned bowls of noodles and beansprouts then ladle the gravy on top. Allow guests to help themselves to the garnishing.